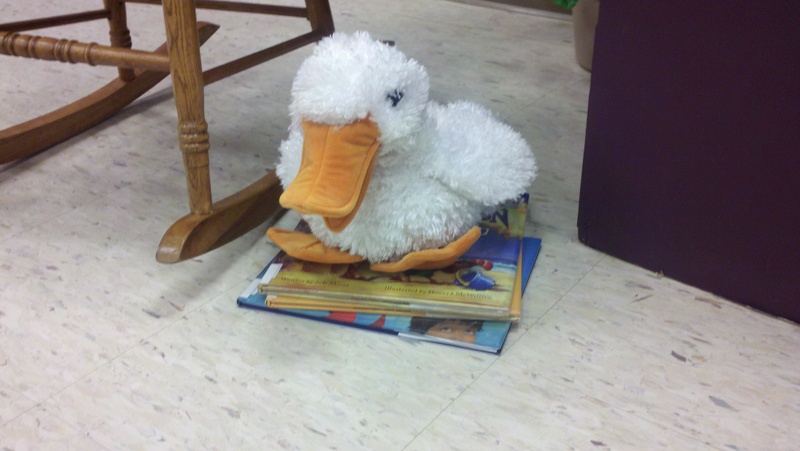 It has been a month since my last storytime post! Oops! I blame the holidays keeping me busy and away from my blogging duties. I am back this week with a very fun dragon storytime! 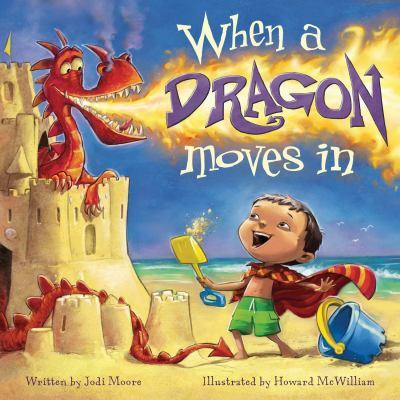 In this book, a boy builds a perfect sandcastle at the beach, and a dragon moves into it (because you can’t have a castle without a dragon, don’t ya know). While having a dragon live in your sandcastle may seem like fun, this particular dragon is a bit mischievous and tends to get the little boy into trouble. So the boy destroys his sandcastle and vows to never build another one again…until the next day. With the beach setting, this book is probably better for a summer dragon storytime theme, but it worked pretty well this week. The kids were all riveted. I found this rhyme in Storytime Magic (what would I do without that wonderful book?). 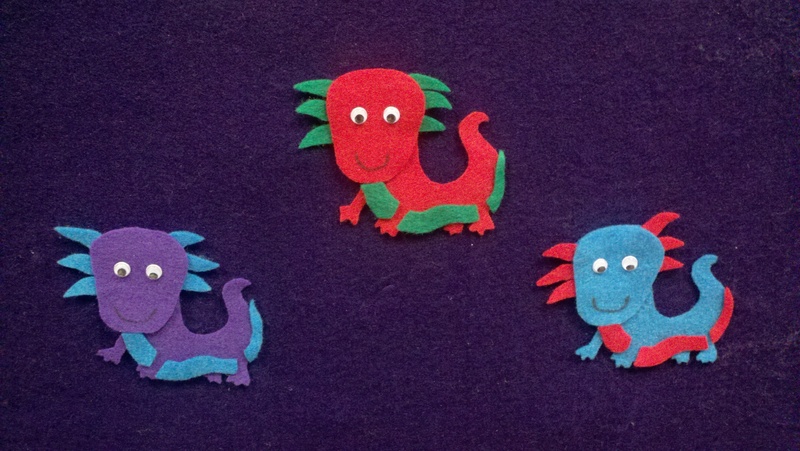 While the book does provide a dragon template, I decided to go with something cuter, so I used some Microsoft Word clipart as my guide for the flannel pieces. The kids would cry out “Ouch” with me, and we’d breath our fire (blowing three times), and then would flap our arms as we flew away. They loved it! One lost his balance and bumped his tail. And then he flew away, higher and higher. This is a story about a group of school kids who decide to make themselves into one big dragon while in arts and crafts one day. It’s a great story about using your imagination, and I love how the dragon trapezes through different scenery — it gave us an opportunity to talk about where pandas come from, the differences between butterflies and moths, and to even find the ducks in the pond (at which Quacky got very excited). 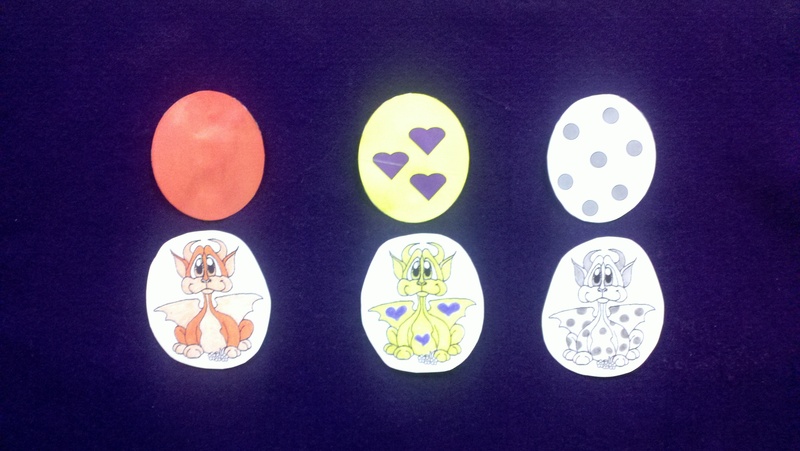 This is a very straightforward activity where we matched different colored (and different patterned) baby dragons to their corresponding eggs. We did this one as a group, and I started by asking the kids to describe the baby dragon. The solid colored dragons were easy to describe, the patterned ones required them to use their words (yellow with purple hearts!). I would then say something like, “Well, if this fella is orange, then he must go with the white egg with gray polka dots.” The kids would of course shout out no, and I would then suggest another wrong egg and eventually have them tell me which one is the right egg. 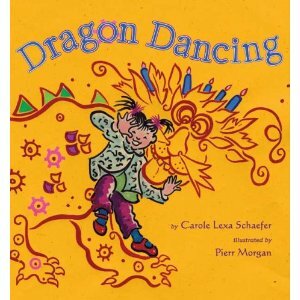 In this book, a young boy decides that he would like to have a dragon as a pet. There are some definite similarities to When a Dragon Moves In, but the dragon in this story isn’t as mischievous. I like your egg-matching game. Thanks for the ideas. 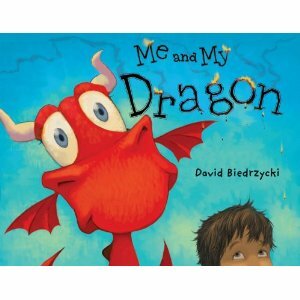 I’m going to post a link to you on my site at http://www.squidoo.com/dragon-storytime. Exactly how much time did it require u to compose “Storytime: Dragons!